It’s a question people have been asking since the dawn of time—what happens after we die? We may not have an answer for that, but we DO know what happens to your estate. If you ever worry that your kids will be stuck paying off estate taxes when you’re gone or fear that the government is going to confiscate even more of your hard-earned money from beyond the grave, listen up. It’s time to take some of the unease out of the estate tax. Most people have misconceptions about the federal estate tax (also known as the death tax). Some think that if you inherit money, you need to pay taxes on your inheritance. Others believe that they need to hurry up and give their money away before they die or the tax man will come after it. They’re not completely paranoid thoughts. There really are some ridiculous taxes out there. But what’s the estate tax really about? 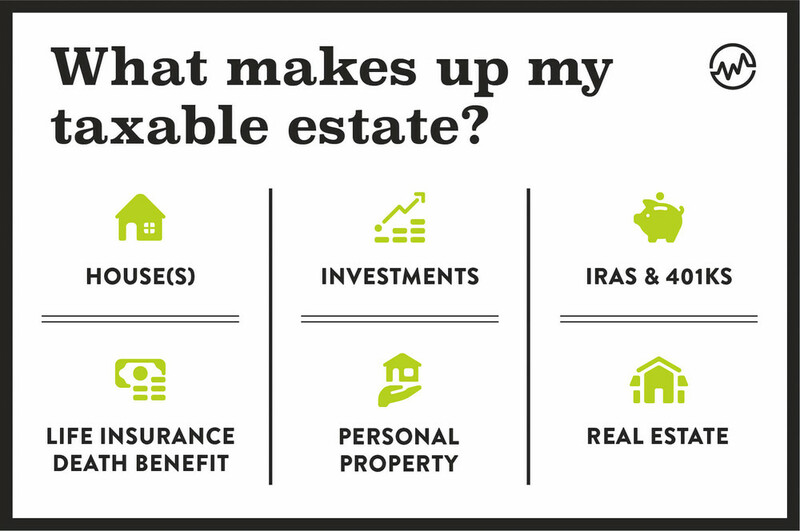 What makes up your taxable estate? Let’s take a look. These are the same assets that make up your net worth. Every now and then, it’s a good idea to put a pen to paper and figure out exactly what that is. When you die, your executor will need to file a form 706 reflecting how much money you had within your estate when you passed. The 201 Tax and Job Act Law: What Does It Mean for You? It’s not only important to know what your taxable estate is. You need to know the laws that apply to it. Estate tax laws have changed many times over the years. Lately, they’ve become more favorable towards taxpayers—dead or alive. The 2017 Tax and Jobs Act Law dictates that the first $11.18 million dollars you leave to your heirs may be transferred without owing any estate tax. This means that if your last surviving parent dies (knock on wood), the first $11.18 million they leave to their heirs (meaning you) would not be federally taxed. This $11.18 million is known as the “exemption equivalent.” That’s the amount of money that can be passed on to heirs without being subject to federal estate tax. That’s a huge improvement from what it once was. Prior to the 2017 tax law, that exempt equivalent amount was $5.49 million. That’s a $5.69 million difference. This means very few people will need to deal with paying the federal estate tax. But what happens if there’s more than $11.18 million left in the estate? Here’s what will happen. Your parent’s estate will file the federal tax return form 706 and calculates the estate tax owed by the estate. Any amount over $11,180,000 is subject to a 40% federal estate tax. It is important to remember that it is the estate that is taxed, NOT the person inheriting the money. 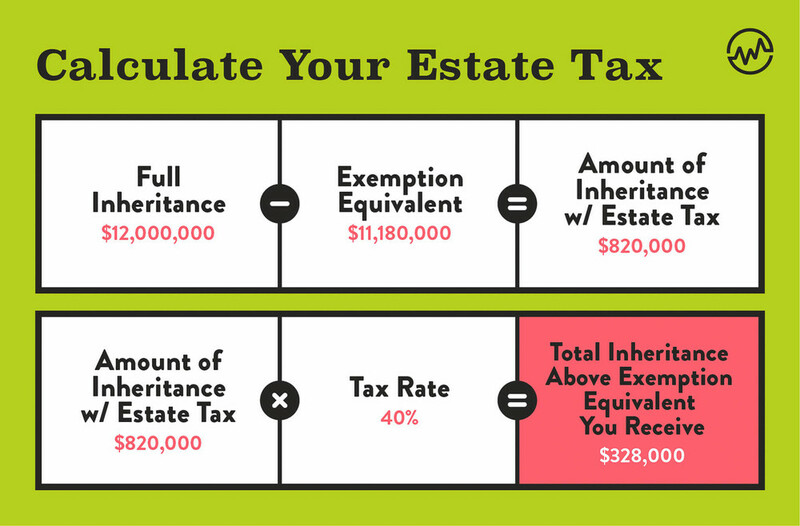 If you know how to do the math yourself, you can run the numbers on how much the estate will owe in taxes. To make it easier, we’ve included the equations you’ll need to use. The estate’s executor is responsible for paying the estate tax using the assets within the estate. The tax collector only accepts cash. This means assets such as businesses, real estate, or farms often have to be sold to raise the cash to pay the tax. Imagine a large family farm that’s been in the same family for a century. Say it’s valued at $20,000,000. The estate tax calculation is ($20,000,000-$11,180,000=$8,820,000)x 40% = $3,528,000 estate tax due. In this case, the family may have to sell the farm to pay the $3.5 million tax bill. Nobody wants to be confronted with that sad scenario. It’s a good thing there are ways around it. What if you make smaller annual gifts? How are they taxed? The current law allows you to gift up to $15,000 every year to a recipient, without having to pay any gift taxes. That means a husband and wife could each give their children $15,000 (or a combined 30k) per year without any gift tax issues. But what if you give more than $15,000 to one person as a gift? Interestingly, the gift and estate tax work together as one. If you give more than the annual gift tax exemption or $15,000 per person, per year, the excess will be counted against your estate tax exemption amount. Scenario 1: Your widowed mother gives you $14,000. The amount falls under the $15,000 annual tax exclusion. There is no gift tax to worry about. Scenario 2: Your widowed mother gifts you $25,000. That creates a gift tax issue for the $10,000 in excess of the $15,000 annual exclusion. The good news? No gift tax is owed by either you or your parent. The $10,000 excess is simply counted against the lifetime gift/estate tax equivalent amount of $11,180,000. This means your mother would have to file form 709 and make note of the gift using that against her lifetime exemption equivalent amount with no tax due. 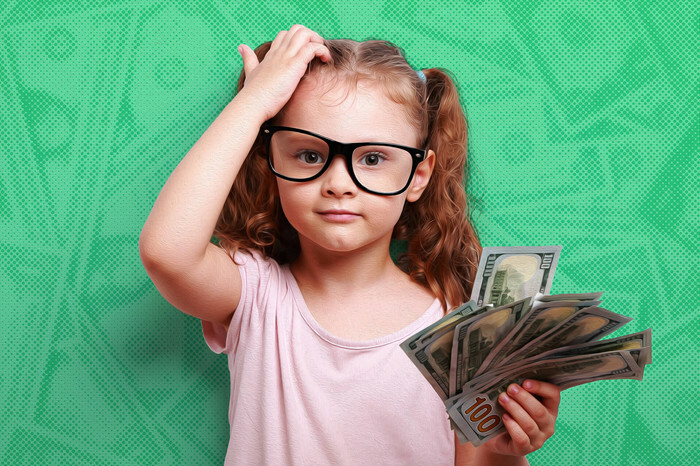 In this case, your mother will have used up $10,000 of her $1,180,000 gift/estate tax limit, leaving her with an exemption equivalent of $1,170,000 instead. Scenario 3: If both parents are making gifts they can give $30,000 (2x$15,000) to anybody they want. In summary, you can gift or pass at death $11,180,000 without any federal estate or gift tax. 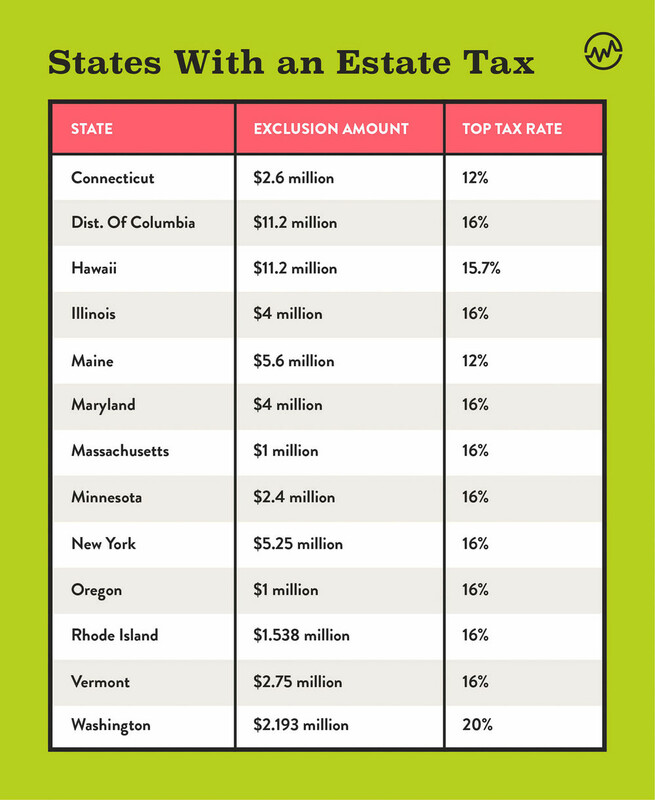 While most people have estates smaller than $11,180,000 and won’t need to deal with the federal estate tax, some states have an estate income tax. So, does your state have an estate or inheritance tax? 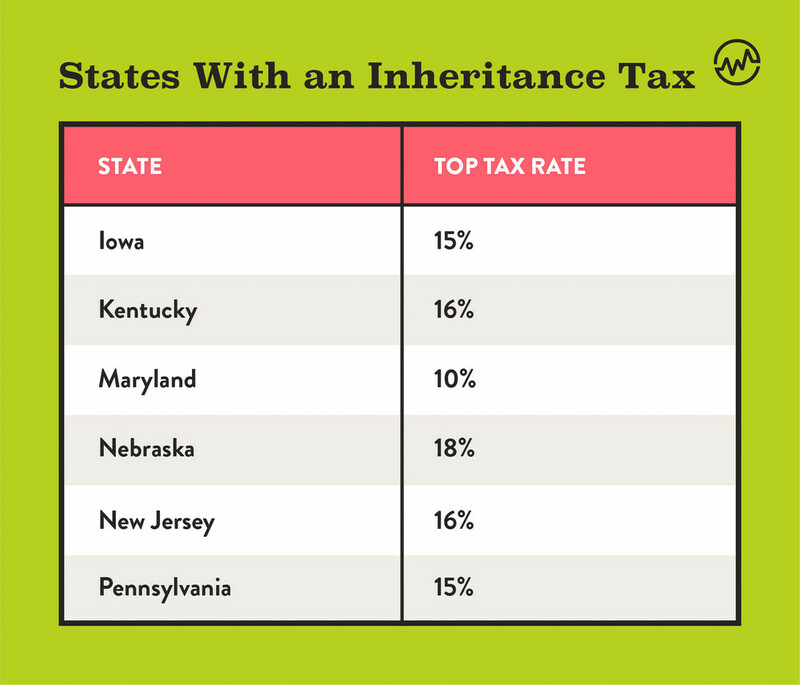 12 states have an estate tax and 6 states have an inheritance tax. One unlucky state poses both (we’re looking at you, Maryland). If your estate is larger than $11.18 million, is there something you can do to avoid the 40% estate tax? Gift assets that are appreciating quickly to your heirs to keep those assets out of your asset count upon your death. As mentioned above, you can gift $15,000 per person per year to reduce your estate size—and let your heirs reap the benefits of the growth of those gifted assets. If you are married, this can be a great way to avoid the 40% estate tax. This advanced legal planning strategy involves dividing a couple’s living estate between two retractable trusts. Each trust can pass up to the $11.18 million dollars to heirs tax-free. Done correctly, this effectively doubles the amount a couple can pass on to their heirs without the hitch of federal estate tax. 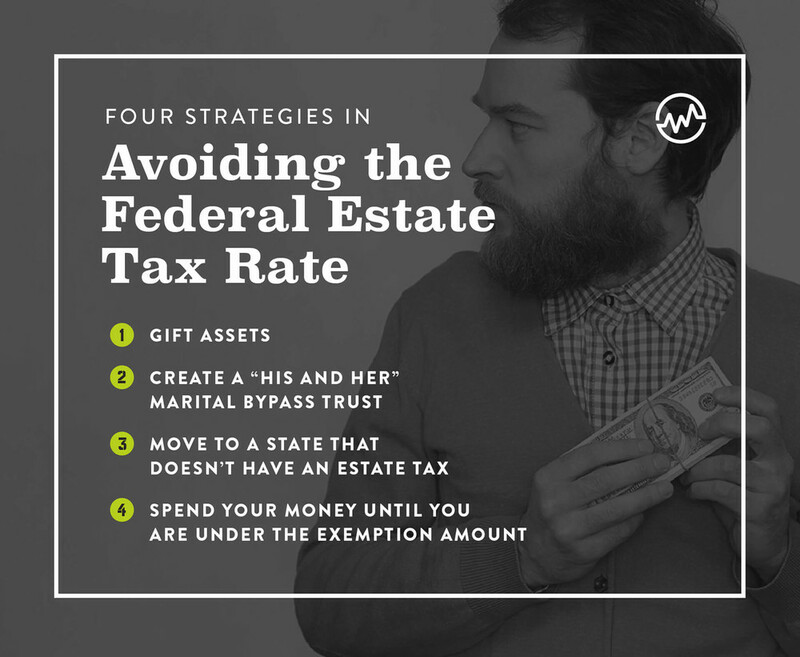 This strategy was very popular when the estate tax exemption equivalent was much lower and the estate tax impacted more people. There are currently 33 states that don’t impose an estate or an inheritance tax. Becoming a tax refugee won’t help you avoid the federal tax, but it could save you some money on state-imposed taxes. If you spend enough money that your estate falls below $11.18 million dollars, you won’t need to pay the estate tax. It’s a simple solution. Buy a jet ski donate to charity and reap some benefits on your tax returns. It doesn’t matter as long as your taxable estate falls below $11.18 million dollars at the end of the day. Very few estates will owe federal estate tax. There is no federal inheritance tax, but there are currently six states that can and will tax inheritors above a specified estate level. Use the strategies you’ve learned wisely and you’ll be able to set your heirs up with a comfortable inheritance.